"Excellence in Milk Quality & Production"
Here at Oly Ridge Farm, we specialize in purebred Nigerian Dwarf dairy goats raised in an attentive, natural way. Located in Washington State, in Kitsap County near beautiful Hood Canal and the majestic Olympic Mountains, we are a cute little farm with cute little milking does (and some cute little hens and several barn cats, also cute, of course). If that isn't enough cute for you, these little does have been known to have the most adorable kids. Check out our Kidding Schedule and For Sale pages for current availability. Our goats are registered with the American Dairy Goat Association. Nigerian Dwarf goats are fabulous additions to your family, whether you're looking for milk, a 4-H project, or fun pets! Oly Ridge Farm was born in July 2010, after a good friend told us about two young goats available at a Port Orchard, WA farm. Just a few years earlier, we had discovered that our son who has autism, loves goats and farm work. 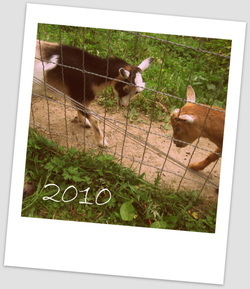 When we went to meet these young goats it was love at first sight! We discovered that in return for love and care, they would provide us with milk and give our son the chance to learn and practice skills for his future. Oly Ridge Farm outgrew its humble beginnings and is thriving in its spacious new digs with room to breathe, and pastures in which to jump, leap and play (and eat, of course)! The focus at Oly Ridge Farm is on natural, organic practices and loving, attentive care. Lisa, the Goatlady-in-Charge, is a certified Family Herbalist. You can find her daily in her herbal dispensary mixing herbs and supplements to meet the individual needs of each goat. Click on our "For Sale" and "Natural Practices" pages, above, for more details and links. ​Kodama Farm & Food Forest, 22 acre farm in Beaver Valley, Chimacum, focused on permaculture-based practices to produce over 300 varieties of unique and heirloom quality vegetables and fruits. Bonus: two beautiful Oly Ridge Farm does make that their home. ​and patterns of Nigerian Dwarf goats. Tips for adopting your first goats. Seven Winds Farm in Montana has done a great job of explaining the myriad abbreviations you see in the pedigrees of champion-level goats (4*M, SG, *B, VEEV87, etc.). "Providing Kitsap County WA with Unique and Fun Goat Services. At Goat Rangers we use our small herd of goats to clear brush, clean up gardens, and even entertain at birthday parties. cook outs, and other outdoor gatherings." A family blog with healthy recipes, tips, gardening, crafts, etc. ​All content on this website is the property of Oly Ridge Farm and is not to be reproduced in any way, shape or form without express written consent.